This appears for the first hour to be a good old fashioned Bunuel-style thrashing of the bourgeoisie and everything it holds sacred, with rogue ops courtesy of rampaging bridezilla, Dunst. 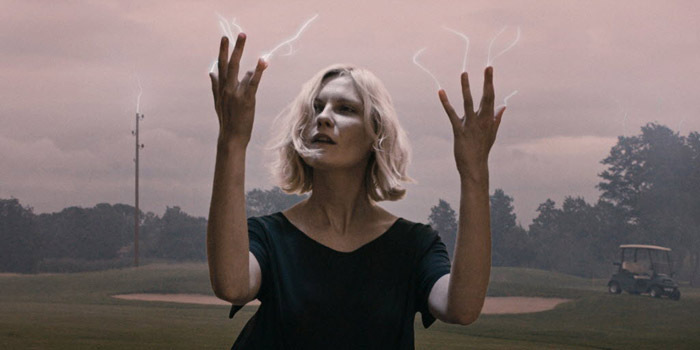 Then Melancholia’s orbit tightens into an understated spiral of high anxiety. The earth is menaced by a rogue planet as Von Trier conflates the tides of his depressed soul into a cosmic danse macabre. Keifer dispels the threat by blinding himself with science but the ever irascible Kirsten, keen for closure, moonbathes in the intruder’s melancholy light, attempting to draw the monster closer by flashing her bits at it. No contest. Heavenly bodies collide. And Wagner. And more Wagner. Actually the same piece of Wagner. The End. And… after a trying start, great! Best film of this blog so far. Yeah, this was a wacky ride. Lars is determined to share his dark, well of deep depression with us. It physically made me sick. But I dug it’s turgid, queasy unease. It was like holding onto an electric fence while somebody rubbed your sphincter with warm cream with a hint of chilly. Weird, but addictive. Yes, its quesy unease and leaden dread were not merely described but transmitted as if the planet had entered the room. Viewing began to resemble morbid compulsion.